If you’ve ever seen Dean Collins with his high energy lighting seminars, you’ve probably wished you could rewind and hear what he said again. 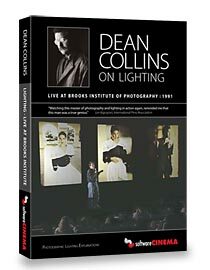 Now you can and you can catch all the fine points you may have missed with this DVD remake of Dean’s information packed seminar hosted by Brooks Institute of Photography in Santa Barbara in 1991. This program is the only professionally captured footage of Dean in action. I have been using your How to Wow in Flash dvd and it’s been extremely helpful. I am looking for an additional teaching resource for the schools I teach at- CCA in Oakland, Expression and Berkeley City College. I loved your dvd because i can easily find the thing I want to learn how to do such as drop down menus. When I tried to figure out how to do this in AS3 I looked at 6 different tutorials and they were all completely different! Especially the AS. I like your straight forward approach.